Executive Producer Peter Lenkov is a busy bee. He travelled to Hawaii for the new season of "Hawaii Five-0" (filming started on July 6th). On the 7th of July, he was back in Atlanta to start production on the MacGyver Reboot. Yes, ladies and gentlemen: It's on! 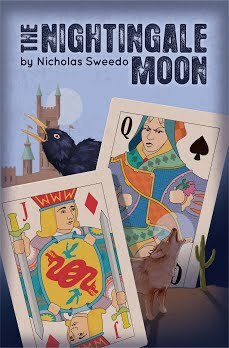 Also, MacGyver goes to Comic-Con this month! Both Lucas Till and George Eads had arrived in Atlanta a few days beforehand. They visited a Target store twice (both times posing for fan photos) and celebrated the 4th of July with actor Michael Aaron Milligan on Lake Lanier (it is unclear for now if "Mike" will be part of the cast). George Eads got a "new" haircut at Supercuts. We can assume that his character of Jack Dalton will look the same as his character of Lincoln for the unaired pilot that shall not be named. Script Writer Brian Durkin shared a picture of a golf cart from set on Instagram; stating it was all "ready to go" on July 5. On the same day, location scout Gonzo Rey posted a few pictures while location scouting in Atlanta. On the 8th of July, Peter Lenkov posted a picture of the first production meeting; featuring the script title page of the pilot episode called "The Rising". The next day, he shared some pictures of the set. It seems like they're building a house - a house with a structure that looks a bit like Mac's houseboat. On the same day, Justin Hires shared a picture of a table read, featuring again the title page of the (revised) script. On the 1st of July, Matt Clanton announced that he would advise and coordinate a tactical team of ATFF (Act Tactical For Film) folks in the reboot. Matt is a former police officer and teaches actors how to fight and use weapons like real fighters, officers or S.W.A.T. team members would; meaning we will get to see some heavy-packed action scenes. His Facebook comment "they are going for the same tone" made us fans of the original show very happy. On the 5th of July, Central Casting sent out another casting call for extras; this time looking for a bald bodyguard for the pilot episode and Asian and Hispanic men and women for several upcoming roles in different episodes. Justin Hires posted a picture of the "MacGyver Squad" on Instagram on July 7. Between Justin and Lucas is actress Tristin Mays (The Wedding Ringer). Has the show found its new leading lady? On the 8th of July, Russell Snipes shared on his Facebook page that he's been hired as Lucas Till's standin. Justin Hires's table read picture on Instagram lists David Slack (Person of Interest) as Co-Executive Producer. On July 6, The Wrap revealed the tv show line up for the Comic-Con 2016 in San Diego: There will be a MacGyver panel with an exclusive sneak peek on July 21. During the 4-day-Convention (July 21 to July 24), CBS will offer complimentary rides throughout the Gaslamp District in branded electric cars. 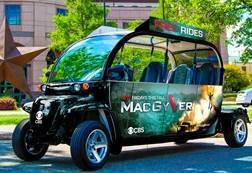 One of the featured shows on these cars is MacGyver, and trailers of the series will be screened for the passengers in those cars as well. 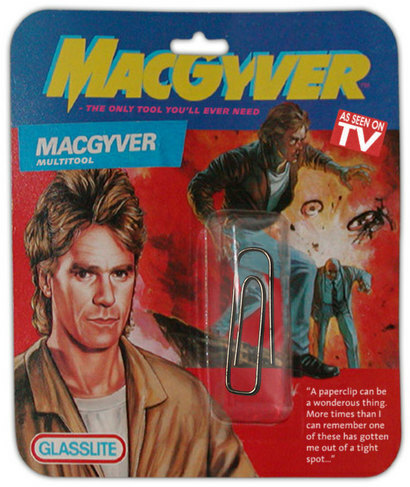 Brand ambassadors will distribute giveaways making their debut at Comic-Con, including the MacGyver “multi-tool”. This "multi-tool" might refer to the new poster that was released. The picture itself is not new (it is currently used for the header of the official MacGyver on CBS Facebook page), but additionally shows a big red paperclip and the tagline "the only tool you'll ever need". On social media, the poster was not well received. French media outlets mocked the cheap looking quality and the overwhelming size of the paperclip. 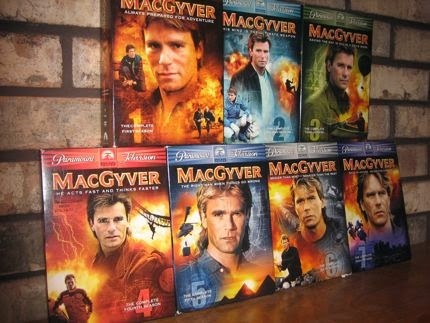 Fans are concerned that people who don't know MacGyver might be misled by the tagline (implying that MacGyver himself is a tool). We have to remember though that this tagline is not new. 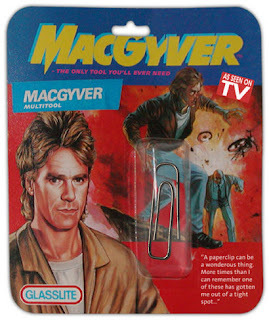 Pictures of the original "MacGyver Multitool" are still making the rounds on the internet. This might be partially responsible why so many people think that paperclips were Mac's favorite tools or that they were used very often in the show (which is not true). What us fans can be happy about for sure: In Ballroom 20, people will get to see a sneak peek (featuring a paperclip?) for Season 1, followed by a moderated panel discussion that Lucas Till, George Eads, Peter Lenkov and James Wan will attend. We can expect lots of pictures, video clips and interviews from this event. Yay! Another great update, thanks Andrea! Too bad I don't live near San Diego for that ComicCon. That would be great if they had a houseboat for MacGyver -- I wonder if they'll bring back the jeep or one of the other classic MacGyver cars. And hopefully people won't get too hung up on pictures or words on a poster. I was just talking to my friend at work about ComicCon -- I don't know much about it and have never been to one, but apparently the one in San Diego is the biggest one of all, and it's so big that Comic-Con has more power in the city than the NFL football team (which is really saying something) which was on display in a recent stadium dispute between Comic-Con and the team. Thanks again Andrea. I'm excited about the reboot. Do I anticipate that I have anything close to the passion I had for the original? No....but I admire that they are giving it the old college try. Looking forward to more updates as they become available.